This was a real prize from my childhood! I won it in an auction at school which I remember as having been organised to raise money for an Italian Earthquake Appeal which would date it to late 1980 - early 1981. 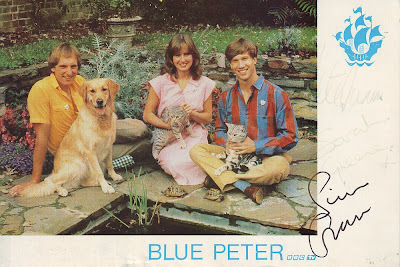 It's signed by the then presenters of the BBC television show Blue Peter Peter Duncan, Sarah Greene (both autographs very faded) and Simon Groom.